Every now and then something comes along that wows you with its practicality, something that just feels right. Something that makes so much sense, you have to wonder how it took so long for someone to come up with it in the first place. The Document Extractor, brainchild of Byeong Min Choe, marries your printer, scanner and monitor into one potentially perfect device. 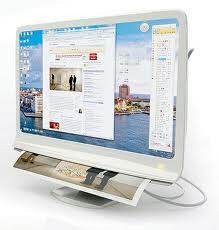 The monitor, has a touch screen interface that allows you to select and crop the area of the page you wish to print, and the selected area will print from the back to the front of the device, dropping from your computer screen into reality. Scanning is a similar process in which the user is able to feed the document to be scanned up into the device and Voila! It appears on your display as if you just feed it up behind the screen. The designer reminds us that the Document Extractor is not simply a space saving device, it will also save us time and resources, like ink and toner. Whatever the benefits of such a device may be to you, we can only hope that someone will actually step up to the plate and create one of these that we can actually buy. Hello Mr. Jobs? are you listening?